What on paper looked a relatively straight-forward and uneventful Stage 5 turned out to be anything but. While Mark Cavendish overcame the lack of teammates to win a scrappy sprint finish ahead of Philippe Gilbert and Jose Joaquin Rojas, the major talking points came further back in the peloton. A whole swathe of leading general classification riders were involved in crashes of varying degrees of severity. First to go down was Team Sky’s leader, Bradley Wiggins. He was caught up in a minor crash as the pace of the peloton suddenly dropped and several riders toppled over. However, he got away with it and was able to rejoin the peloton with relative ease. 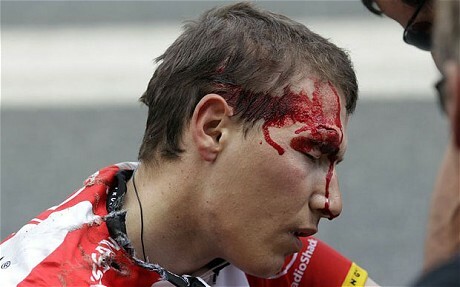 Next to go were Janez Brajkovic and Robert Gesink in a nasty incident. It was one that was to end Brajkovic’s race – a real shame for a strong contender for a top ten finish. He went down and several other riders including Gesink rolled over him. He was unconscious for several minutes and was taken to hospital with a concussion and a fractured collarbone. Robert Gesink looked badly shaken by the incident, but was able to rejoin the peloton, albeit after a tremendous effort by him and his teammates. Alberto Contador was the next to go over. It was unclear what caused the crash, but he was clearly not a happy man as he threw his bike off the road and into the ditch. Elsewhere in the peloton, Sylvain Chavanel suffered a partial dislocation of his right shoulder, Tom Boonen suffered what looked a fairly serious collarbone injury and is unlikely to play any further part in the race. The most worrying incident involved Nicki Sorensen. He found his bike caught up in a motorbike and was dragged along the road for a short distance before disentangling himself from his bike and falling down the verge on the side of the road. Thankfully, he appeared ok, but questions must be asked about the motorbike driver. After all the incidents of today’s stage, Stage 6 sees the riders undertake the longest stage of the race at 226.5km. Similar to Stage 4, there is a decent climb 1.5km from the end of the race, which means that we are likely to see some familiar faces back at the business end of the peloton. It is likely to see somebody going from the start of the final hill and looking to outlast his rivals. For the third time in the six stages, Philippe Gilbert begins as the favourite. He is also rapidly putting himself in contention for the green jersey with consistent finishes in all types of situation. He will undoubtedly be there or thereabouts tomorrow and Boyle Sports offer the best price at 7/2. Whether the traditional sprinters will be involved is a major question. Whether the finish is uphill enough that it will rule out the likes of Mark Cavendish and Tyler Farrar remains to be seen and the question marks can be seen in the variety of odds offered on them. Cavendish is anywhere from 5/1 out to 9/1, while Tyler Farrar ranges from 14/1 up to 28/1. Personally, I think that it will just be too much for them and it will suit a puncheur more than a sprinter. One of the most powerful sprinters might be in with a shot though. 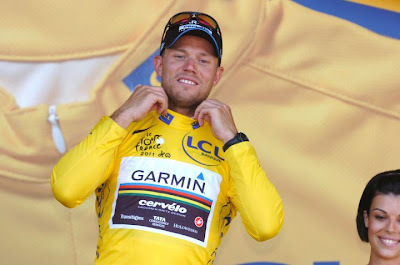 The yellow jersey wearer, Thor Hushovd, climbed excellently on Stage 4 to remain with the leaders and may fancy his chances once again. Amongst the other sprinters, Jose Joaquin Rojas is a strong contender, as are Edvald Boasson Hagen and Romain Feillu. On the other hand, a puncheur may fancy pushing for the win. This brings the likes of Alexandre Vinokourov, Thomas Voeckler and Jerome Pineau into play. Vinokourov is desperate for a stage win and has been up the front in virtually every stage so far. Thomas Voeckler attempted to go for the win from way out today, but was eventually brought back by the peloton. There are one or two outsiders to keep an eye on. Vacansoleil rider, Borut Bozic, is one such rider. He will be primarily looking to help Feillu on the sprint, but if he struggles up the slope, he may look to go himself. 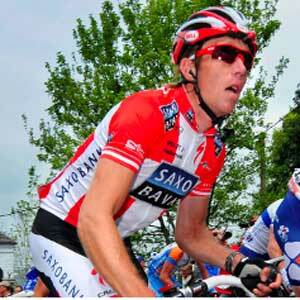 Looking at the other riders who performed well on Tuesday, Rigoberto Uran is a good climber and Cadel Evans is likely to be in the mix. It is difficult to pick a winner for this stage, but fingers crossed, it should be less dangerous than today. There is unlikely to be too much time won or lost here, but there may be the odd second here and there.